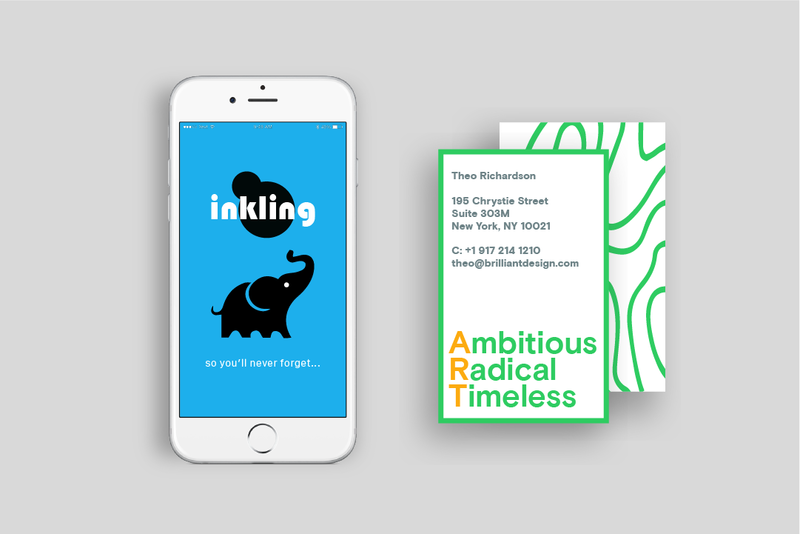 Born out of necessity, Inkling is a mobile app that streamlines the process of storing and retrieving business cards. Exchanging business cards is a sacred ritual that speaks volumes of our professional intentions. We spend hours designing THE card that has a touch of our personality and makes a good first impression. 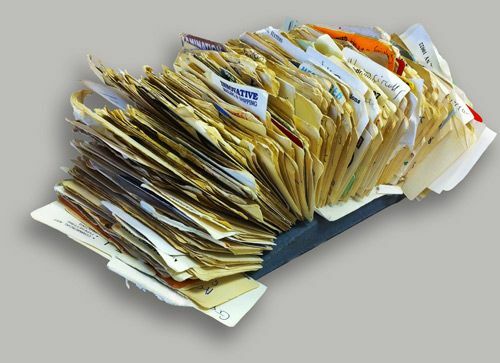 We love them the minute we get them and hate them the moment we boot CRM software or flip through the rolodex. Often we’d give up in the process and abandon the cards to collect dust, diminishing the value of networking. Or yet, do you remember running to a very important meeting only to realize that you've forgotten the business cards? After accidentally misplacing a couple of very important contacts, I thought there must be a better way! My initial reaction to the problem was, perhaps a little too ambitious, but to get rid off the cards entirely, replacing the physical exchange with digital sharing. But after interviewing tens of professionals from different backgrounds, it became apparent that people weren't ready to let go off the analog experience. As much as they hated dealing with cards afterwards, the love of getting them was stronger. It was like exchanging a handshake, an important step in starting your professional intentions. So I focussed my efforts on processes of storing and retrieving cards. 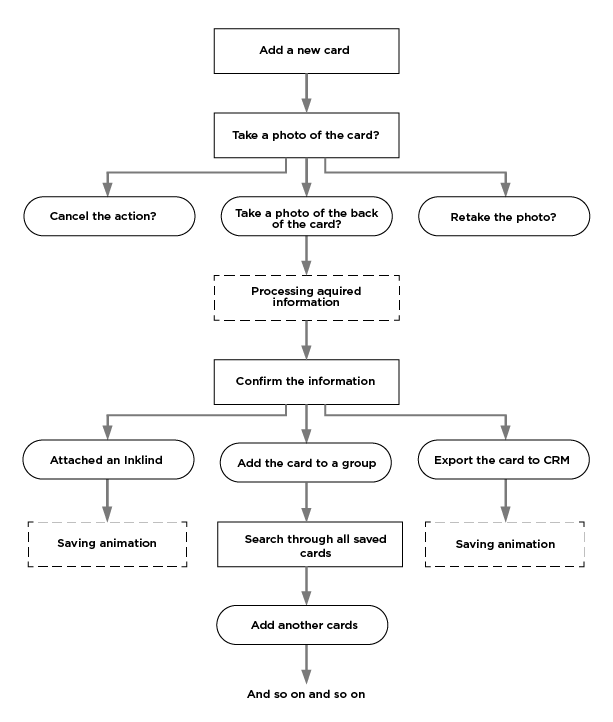 The soluting was to use a popular Optical Character Recognition (OCR) technology that scans the cards and reliably processes visual information. Users then have an option to attach personalized details, inklings, to help them retrieve the information later. Attached inklings help people to remember information that is not necessarily obvious from the details on the business cards. Every card can be synchronized with phone built-in contact database and CRM softwares. As I tried to define what were the most tedious parts of the storing and retrieving process, I came to the conclusion that it was the monotonous pinching in the letters and numbers, which in our increasingly digitized world should be carried out by computer algorithms. The user flow on the right demonstrates the initial user response that eliminates almost all mechanical input from the users, allowing to concentrate on more exciting parts on networking. The rectangles represent key pages, the rounded rectangles represent moments where users are asked to make a decision, and the dotted rectangles represent animations.